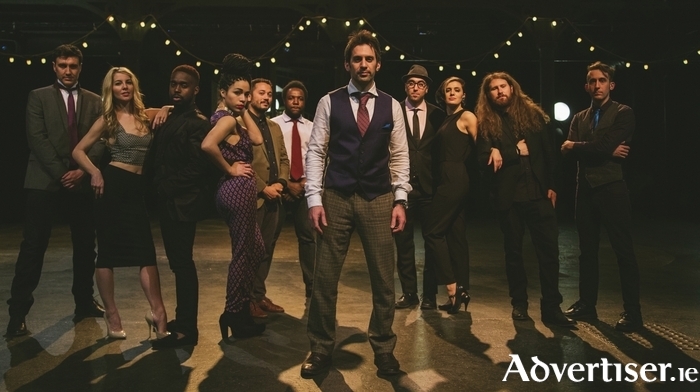 Scott Bradlee (centre) and his Postmodern Jukebox. SCOTT BRADLEE'S Postmodern Jukebox has clocked up millions of YouTube hits, but the man and his band's approach in rendering Miley Cyrus’ 'We Can’t Stop' as doo-wop, and Sam Smith’s 'Stay With Me' as 1940s big-band, is as much about education as it is about entertainment. Bradlee wants to open audiences' minds to the vast array of 20th-century song styles, and how songs from one genre can be used to display the values of another style. He also wants to confound expectations and cultural context, and show different generations that their taste in music does not necessarily divide them. Bradlee pursued jazz studies at the University of Hartford, then moved to New York, playing jazz piano, where "jazz pianists are a dime a dozen". In 2009, he started making online videos of himself performing jazz numbers. Eventually he decided to try an experiment by playing eighties pop hiots in a ragtime style. Though it only got 100 views, one of them was by the acclaimed author Neil Gaiman, who Tweeted the video, turning millions on to the New York musician. Since then, Bradlee has never looked back, and the Postmodern Jukebox live shows have won great acclaim for their energy, joy, and high level musicianship. Reflecting on his approach to music making, Bradlee says: "The bass line in ‘Blurred Lines’ reminds me of bluegrass. ‘Sweet Child O'Mine’ sounds like an old blues song – the structure, the way the chorus repeats." Scott Bradlee's Postmodern Jukebox play a 'Róisín Dubh presents...' concert at the Seapoint Ballroom, Salthill, on Saturday February 27 at 8pm. Tickets are available at www.roisindubh.net, the Ticket Desk at OMG Zhivago, Shop Street, and The Róisín Dubh.